Locating leaks Known distances for correlating. Lowflo supplies several different types of underground pipe locating equipment designed to equip you with the latest technology to ensure the most accurate results. Metallic pipes – Lowflo supplies the hugely popular Cable Avoidance Tool (C.A.T.) 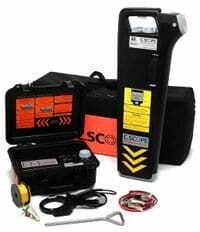 from C. Scope and the 1420 and 2250 locators from 3M. The C.A.T. is the most popular locator used in Ireland today and has proven itself to be invaluable tool in leak detection. For situations that require specific identification of particular pipes and noteworthy points Lowflo supplies a unit that identifies Electronic Markers placed in the ground to identify specific points. This is cutting edge technology and allows for advanced locating and mapping interfaces with GIS. Non-metallic pipes – Lowflo supplies a Pulse Wave Generator, manufactured by F.A.S.T. Using acoustic technology the pipes can be located with the help of a ground microphone system.